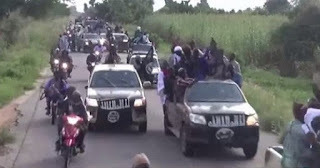 Reports reaching us now indicates that Boko Haram terrorists loaded in 11 trucks, on Wednesday morning, gained entry into Dapchi town in Yobe State, Daily Sun Reports. Our correspondent is among newsmen currently on a fact-finding visit to the troubled town and reported that the counted 11 trucks full of the terrorists entered the town with gun-wiedling members of the sect packed inside them. It was reported, however, that no gushot has been fired as at the time of filling this report.